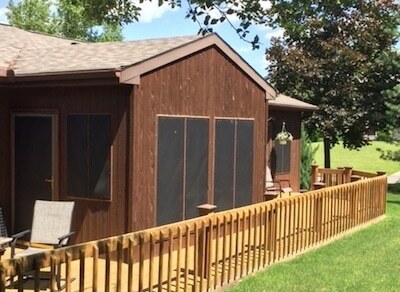 After more than a decade of providing high quality shade and skirting materials, EZ Snap has thousands of happy customers. Here are some reviews that we have received from all over the USA,Canada, and Australia. I live in Idaho so I had to get ready for the long winter! It has worked out very well for me! Thank you EZ SNAP for a great product! EZ Snap® Team - Thanks for your positive feedback and photo Mr. Ball. I absolutely love my skirting! 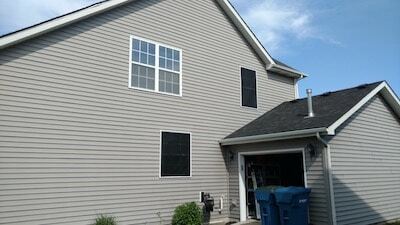 My son and I were able to install it in one afternoon and my family loves the results! 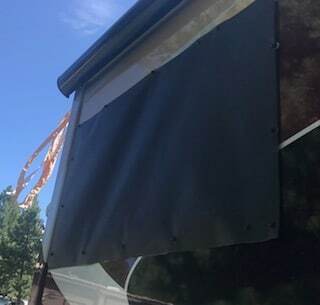 We bought a brand new 42 foot 5th wheel a few months ago and our biggest complaint was the lack of insulation, even though the underside is sealed. 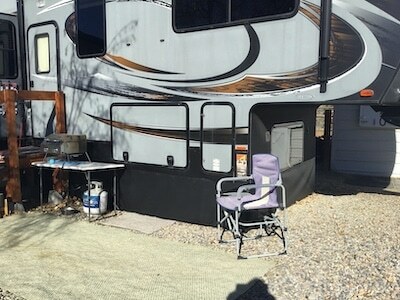 After installing the EZ Snap skirting, we are much happier living in our RV during the winter because the heat stays inside whereas before the skirting, the wind would blow under the trailer and take all of the heat with it. 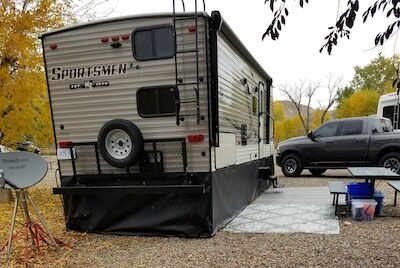 We purchased the kit and the optional 5th wheel cover, to enclose the front section, and it really completes the package. If you elect to use the adhesive snaps, be sure to completely prep the surface before installing to get the best results. EZ Snap® Team - Thanks for your order... and sending photos Robert! Thank you for sending my EZ Snap as you promised. 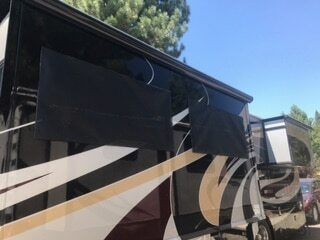 I am a retired widower so my son in law installed the EZ Snap by himself on my 44ft Cyclone Toyhauler. He only cut it twice, then installed it with 2 long pieces. I have 2 sewer dump lines and he cut those out and made flaps for them. It took him all day, by himself, but he got it done. I live in New Mexico and it does get down to the 20’s at night in the winter. 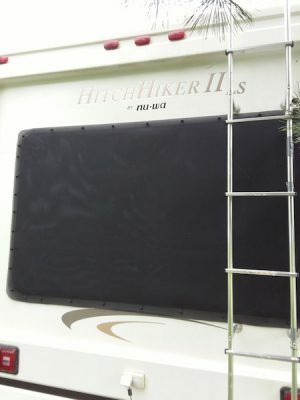 He just installed it in November and it keeps my RV 8-10 degrees warmer. I am very pleased with your product and so is my son in law. EZ Snap® Team - Thanks Carole... happy to hear EZ Snap is keeping you warmer in New Mexico! Overall, I was extremely pleased with the EZ Snap product. I would not say it was easy and quick to do, but most things that are worth it are not! The product is very easy to work with and to be done right must not be rushed. It was definitely a 2 person project. 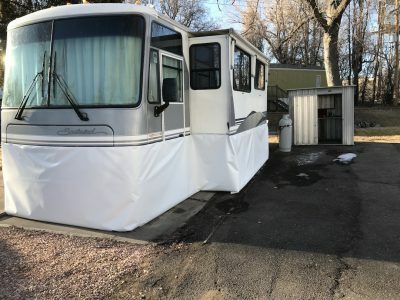 We wrapped the bottom of my 24 by 10 tiny house on wheels. The added challenge was that it is on a slight slope. One end is about 12" off the ground and the other end about 30" off the ground. 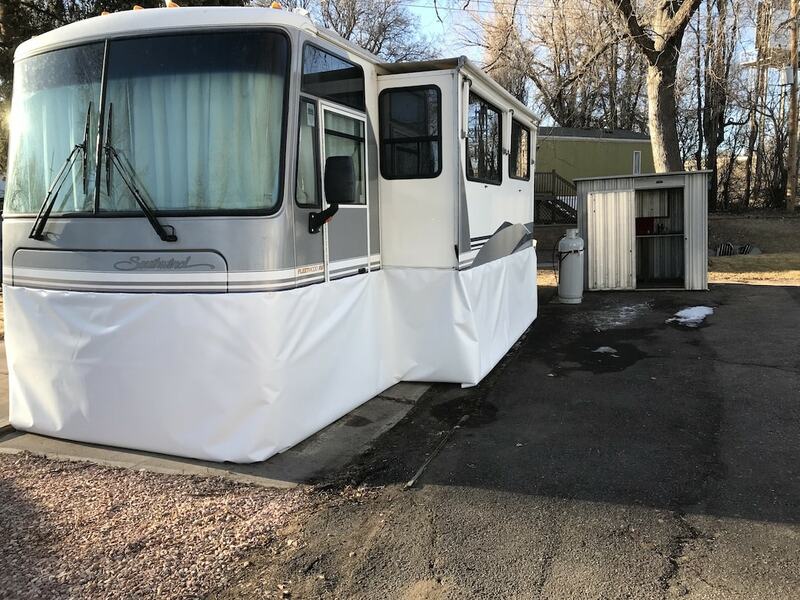 The plan was to attach the skirting to the trailer but we quickly realized that was not practical so we ended up placing the snaps on the siding, not my first choice. We decided to start at a corner. The wheel wells were actually not an issue and covered easily, a major reason we could not attach to the trailer. It was a challenge around the heated hose, the heat pump mount, and making sure the instant water heater gas vent was easy to keep clear, as well as the water outtake. Because they are close to each other, we were able to Velcro ( what a great tool) a seam so that it can be unsnapped when house in use. Last real challenge was the lower end and getting [around] the trailer hitch where the propane platform is mounted on the hitch. This of course has to be accessible. Well we did it! Am I going to unsnap to remove during the summer season? I doubt it. Will probably just unsnap some small sections for air flow. All in all it was a well spent 8 hours. I'm anxious to see the winter goes. EZ Snap® Team - Thanks for your tiny house skirting review and photo. Nice work Judy! First time living in my camper over the winter. Not going to lie I was quite nervous for freezing pipes, cold drafts, and an uncomfortable camper to live in. 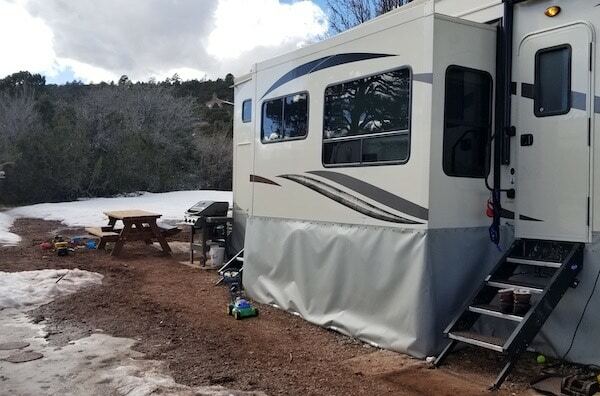 I order the skirting kit for my camper within 2 hours I had it all up and my camper is draft-less, I’ve had zero issues with freezing, and the most important thing is, I’m comfortable. 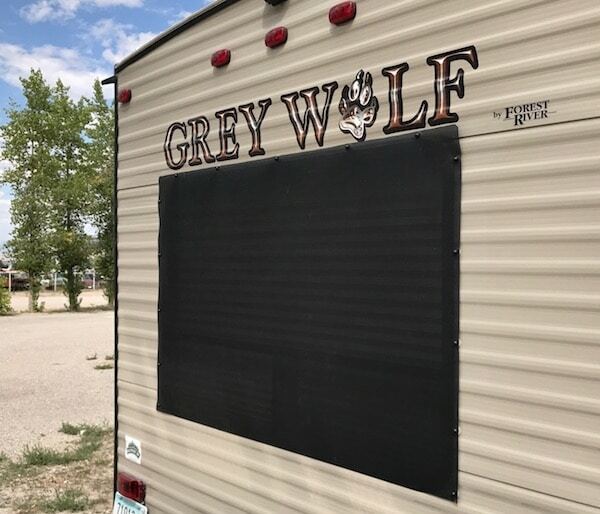 Thank you to you guys for providing a product that allows me to live in my camper year round! 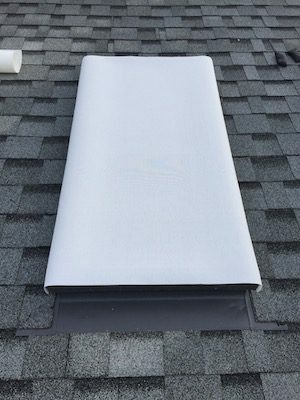 EZ Snap® Team - 2 hour installation is one of that fastest we've heard about. Thanks for letting us know Nathan. The kit and additional accessories arrived in great condition and quickly. The kit was installed on a 27 foot pull trailer. 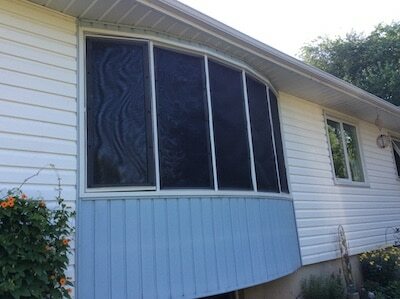 As others have indicated, you have to plan ahead on the installation and as always measure twice and cut once. After formulating a plan, installation took only a few hours. The skirting was used on two hunting trips where the night temps were in the teens. The installation once at our camp site went fairly quickly for both trips. Overall, I am very happy with the skirting. I had questions from a few other hunters as to where I got the skirting, so hopefully you will get a few more buyers. EZ Snap® Team - We are happy to hear that your EZ Snap Skirting is working well for you. EZ snap arrived in one box with great instructions. We were able to secure all the snaps and let them cure for a few days before tackling the skirting. My only caution is to people who have arthritis. It is pretty hard to secure the snaps. To remove the skirting is pretty easy for travel. The snap removal tool broke while removing the second snap, but a butter knife works great! The skirting looks good and works at keeping your rig warmer. EZ Snap® Team - Thanks for sending your review. 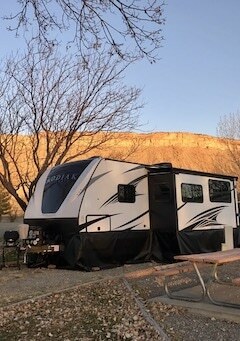 I have 38' 5TH wheel I received my EZ snap in good condition, Went to EZ snap site and watched installation video and 8 hours later I was done. 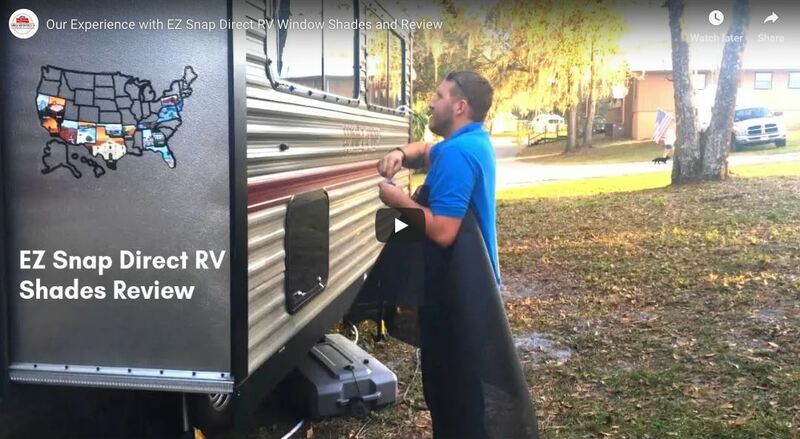 EZ snap went on the RV rather simple just make sure to give it some pre thought. 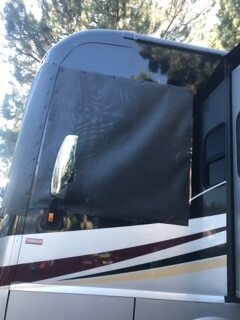 I would recommend EZ snap to anybody skirting their RV. EZ Snap® Team - Thanks for your review and photos. Very nice installation! We really have put our EZ Snap Skirting to use. It was easy to install and we used the adhesive tabs. We have since had to screw on a few of them because we put blocks underneath and I think we put them too tight and it pulled too much on the tabs, but it has so far held very well. The Velcro doesn’t stick great but we started when it was rather cold out so I think that was a problem also. EZ Snap® Team - Thanks for your review. As you have learned, it is important not to place heavy weights on the bottom of your Skirting (since it will pull the 3M Adhesive off). We recommend using a 3/4" plastic pipe frame with weights placed in behind for best results. 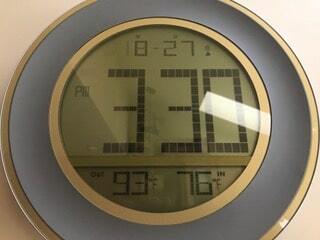 Installation temps for 3M and Velcro are MIN 60 F for a few days and nights. Looks like we had it made professionally. It did not take long to do. Material is high quality and durable. 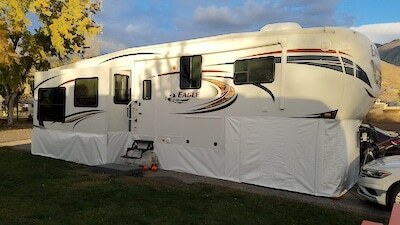 EZ Snap® Team - Glad to hear you are happy with your EZ Snap RV Skirting. These work great. We live in a very windy region & they continue to perform very well. 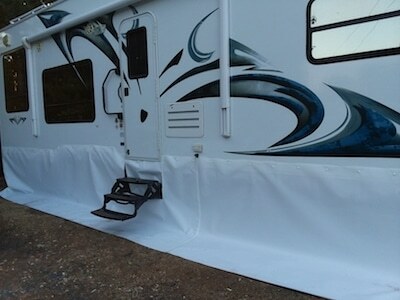 I used the skirting on a 30' travel trailer following the directions, along with the helpful hints. It was installed in what we call the high desert in Eastern WA. I installed the PVC frame and added 3 cross braces. After the complete installation I added concrete blocks on all the corners including the pop out. 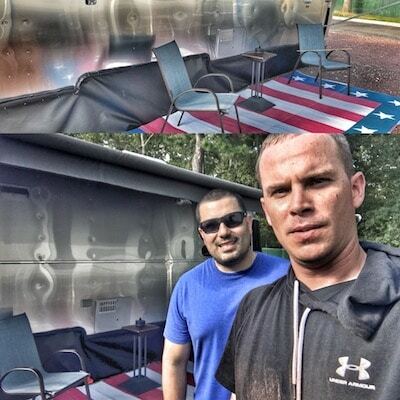 I believe it increased the inside temperature of the trailer about 10 degrees or so. I am pleased so far. See what happens through the winter. EZ Snap® Team - Thanks for sending us your review. 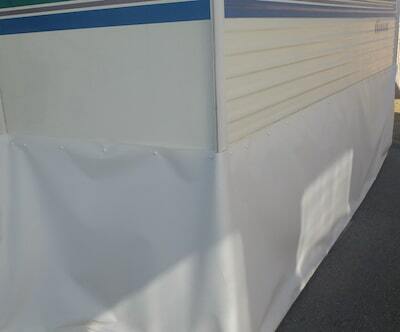 First and foremost I want to tell you, GREAT WORK in designing an awesome RV skirting system! I live in Wyoming and have for many years. Up until recently I was traveling all over the US working as a traveling Flight Paramedic. I got tired of being away from home and decided to change jobs to a paramedic job closer to home. I now work as a paramedic here for a County Emergency Medical Services, but it’s still two hours from my house. 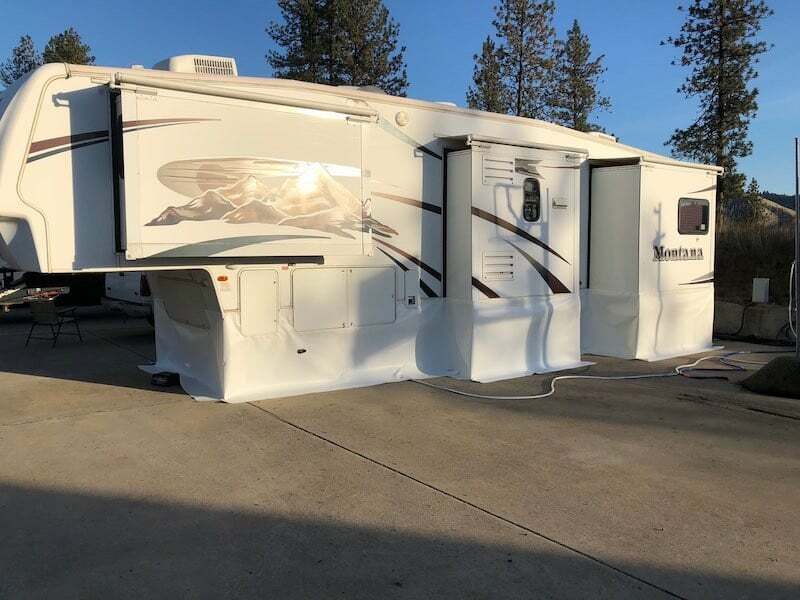 When I got the job my wife and I decided that I would need to get a new camper of some sort, to stay in, when I am in between my 24 hour ambulance shifts. 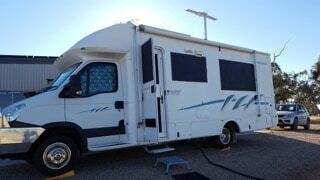 We traded in our small 18’ travel trailer toy hauler and bought a used 40’ fifth wheel toy hauler. 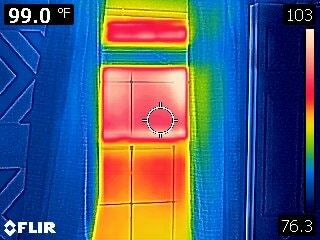 This all went down over the summer and I really hadn’t thought about skirting.... that was until one night in September when the temperature dropped down into the 30’s! That night I really started thinking “this is gonna get BAD”! So I started looking around immediately for a skirting solution. After a ton of research and some extremely scary pricing, I found your product. Initially I thought it wouldn’t be worth it, as there would be no way it could hold up to our winds and cold temperatures! I then did a ton of research and started to realize that not only would it work, but it also wouldn’t break the bank. 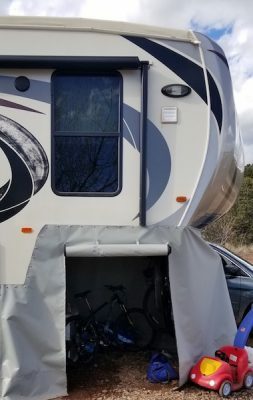 I sized out my RV on your website and ordered everything I needed. 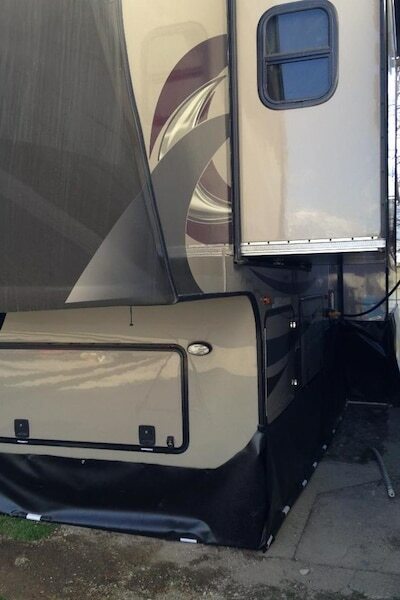 I also ordered the optional fifth wheel skirting kit with the trailer skirting. I was really looking forward to getting it and installing it, because winter weather was coming! So when I got it delivered I was stoked! Delivery was really fast and it only took like 5 days for me to get it. I followed the video instructions and installed all of the hardware first. I ordered the snaps with the adhesive and the screws, because I figured they would be the best for our insane winds here in Wyoming. This turned out to be the case, but I’ll go into that more in a minute. I was only able to get the hardware installed when I had a day off work, so I had to wait a day to install the trailer skirting. On the day that I installed the trailer skirting it was a beautiful day with no wind. I got the the skirting sized and installed, however I didn’t have time to install the pvc pipes and pipe clamp system. I thought this wouldn’t be a big problem, because I was gonna finish it up two days later when I was off work. However.... not so much luck. The day after I installed the skirting and was sitting at work, a sting cold front pushed through and the winds picked up to 70+ mph. I figured I was in big trouble. I figured this stuff had no chance of being attached still, because without the pipe system it would be flapping so bad that it break the pins. But there was nothing I could do but hope because I can’t leave work and leave an ambulance uncovered. 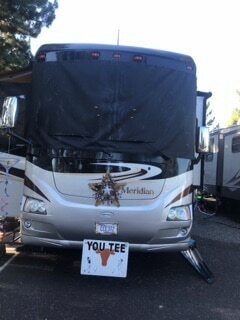 When I got back to the trailer I was floored! Only a very small section had come loose and as it turned out, it wasn’t the pins or snaps that broke but I fact a few caps had come loose. This allowed the material to come off of those pins in the wind. I don’t however believe this to be the fault of the product, I actually think I didn’t have the pins in the caps all the way. I reinstalled the ones that were missing and secured everything with the pipe and pipe clamp system it’s cement blocks behind it. 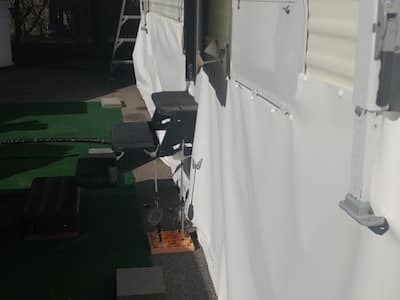 Now the thing is totally skirted in and with a small electric heater underneath the trailer running on low, the ambient temperature under the trailer is normally at least 30 degrees warmer than the outside temperature! I also use about a quarter the amount of propane every two weeks that I was using before. The trailer stays way warmer than it did before and there’s no drafts from the undercarriage! I highly recommend the product to anyone looking for skirting that you can install yourself! 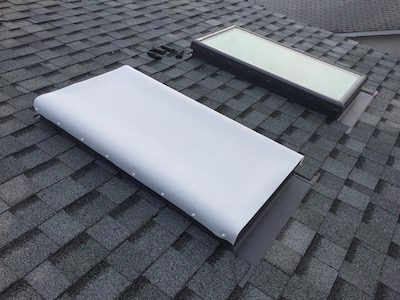 It looks great, works great and is easy to install. Just make sure you don’t do what I did. If your gonna start the install , FINISH THE INSTALL. That way you don’t have to do things twice. Thanks for the great product, that works excellently and as advertised! Bring on winter! EZ Snap® Team - Thanks for feedback Jeremy. This is a great product. I received my order very fast. EZ Snap fasteners are amazing. I did not want to drill holes in my brand new camper so this was a game changer. I followed the direction to the letter and had a flawless installation. Two people to install is a must; my son kept tension on the vinyl and aligned with our mark while I pushed it onto the studs. They also included a vinyl trim tool with the kit that made trimming excess much easier than using a razor blade. I used a razor knife to ‘flare’ the bottom so it would fold under on the corners properly and the vinyl was difficult to cut which told me it is very durable, high quality material. We built a frame with 3/4” PVC around the bottom and used the pipe clamps to secure it and it makes for a very clean, professional looking finished product. I will recommend this kit to everyone! EZ Snap® Team - Thanks for your positive review Mr. McKillip. Our EZ Snap skirt arrived undamaged, no missing parts/pieces and on time. The steps were very simple explained, the steps easy to follow, and the installation easy to complete. This was done with a two person team (my wife and I). The total time was approximately 6-8 hours. 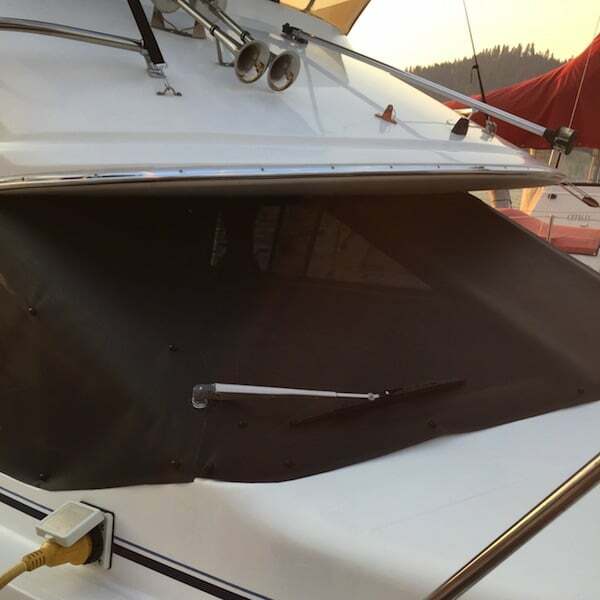 We installed the skirt in the great state of Washington, just toward the end of the summer season. The skirt has now been up for just a little less than a month, has been holding up well, and doing what it was designed to do. EZ Snap® Team - Great feedback, thanks Derrick. I am happy overall with the final result. I did paint my clips black so they matched. Everything else you can get different colors except the pipe clamps. 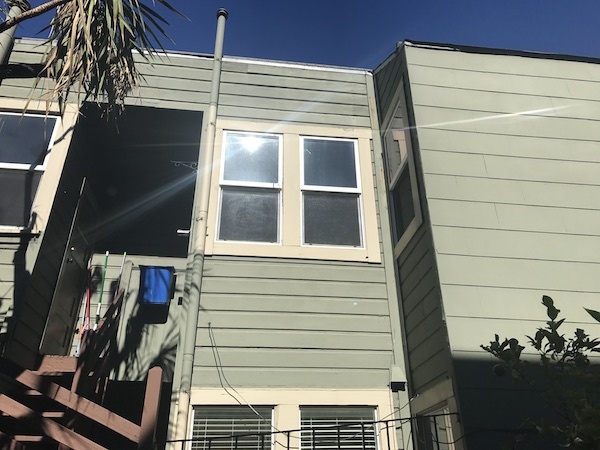 However it did take longer than advertised due to the amount of preplanning that you need to do in order to install correctly. The actual install only took a few hours but figuring out how to go around steps, bumpers, tongues and slide outside takes a while. Also pre plan where the snaps are going and where you want to double up for overlap and cut outs. 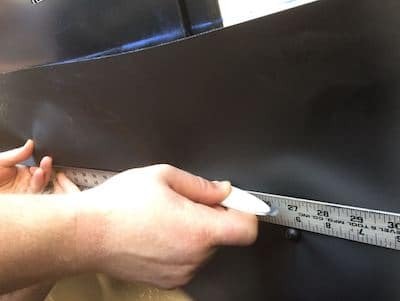 If you want to put your snaps closer together then the 10" max you will probably need to order more with your initial purchase... we have a lot of wind so I wanted them every 8". 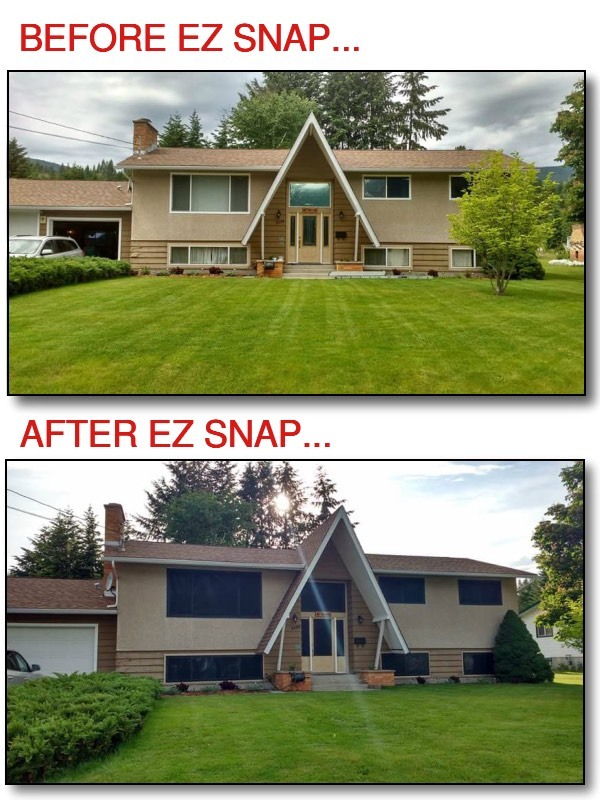 EZ Snap® Team - Thank you Mr. Rusk for your review and photos. Very nice installation. The folks at EZ snap were wonderful. They took great care of me and I received the exact kit I needed plus more. I couldn't have asked for a better transaction. 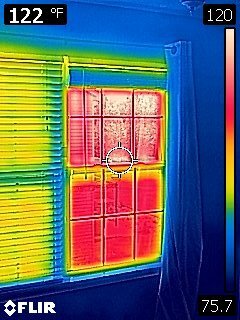 I'm looking forward to the winter to see the difference in my heating cost. For the last 2 years I've just about frozen to death in 20 degree weather for weeks on end. All reviews told me it was good for negative 40 degrees so I'm hoping for the best. The product quality was good and the ease of installing was pretty good. All of the agents were very good to lead me into the right direction of what I needed. EZ Snap® Team - Happy to help. Thank you for your review Debra. Thanks again for the wonderful product. 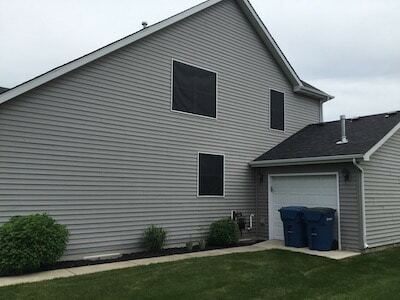 Absolutely great quality and easy instructions... Would definitely recommend your product and next spring will be ordering your window shades. EZ Snap® Team - You're welcome... thanks for your positive review. Now, if you follow the video that’s on their website, you’ll be just fine doing this. My son and I did mine. I have a little arthritis so I used pliers to put the pins on. The rest was fairly easy. I’m very happy with this skirting! I spent approximately, $840 on the whole project. That’s including the pvc pipe. If you have a skirting company come and do this for you, it will cost upwards of $2300 or more! We’re not professionals, but I think it’s just fine. Thank you, EZ SNAP for your product and your support. EZ Snap® Team - Thanks for sending us your review and photos Tamara. Nice installation! ... Looks very nice after skirt was in place and my brother spent some extra time cutting and hanging the skirt around the stairs. I live in trailer full time. EZ Snap® Team - Great feedback, thank you Judy. The guys were great and full of information on how to have a successful install. Super helpful. Well a few weeks later I got to installing the studs to the trailer. I elected to use the adhesive type and had a warm day to install. All went well. I left the them to cure for a week or so. I was given the info that if you can leave the studs to cure for at least 3 days they would have better strength of adhesion. I also used the primer pen on all the locations which increases adhesion. I got busy so the skirt install didn't happen for a couple more weeks. I watched the video and this sure helped on installing the skirt. We laid out the material and measured the first section to start with. 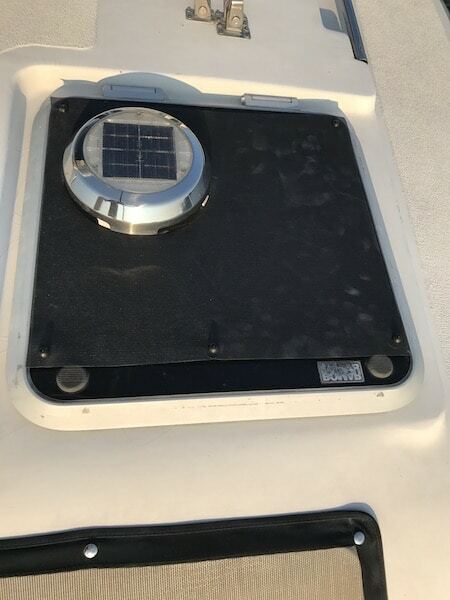 We elected to do the install in 5 sections plus the fifth wheel section. I have 2 slide outs and they each had one section of the 5. We over lapped the sections so as to not have any open joins. This was a good plan and will only need short pieces of velcro to hold the sections together. The biggest question was to how to go around the stairs as I have 4 steps added out of wood as I am not using the trailer stairs. Well with some thought and slow cutting we figured how to do it within a section and not have to piece meal in pieces. Last but not least, we did the fifth wheel section and this went very fast even with placing the door having been sewn into the section. We moved the skirt around a bit to get the right placement so it was fully accessible. Thank you to EZ Snap for the kit and their help. Very happy with the result and the look. EZ Snap® Team - Thanks Nick! We are new to the EZ Snap family and excited to have finally found the product we have been needing! The two of us did the install in one day, which was made interesting by a quilter's measuring methods and a Highway tech's design haha! Measuring tape to t-square, and a lot of "eye-balling" to level the line made for some entertainment for the passers by, curious what we were up to. They shared their stories of ice cold RV's with frozen gel foam mattresses to frozen water pipes and we told our memories of -4 camps with wind and snow far from any civilization, trying to keep thawed and warm. That camp spurred our motivation to keep saving up for what we knew we needed. Each phone call and email to staff at EZ Snap was so helpful and the advice well taken. Certainly made the job go smoother! 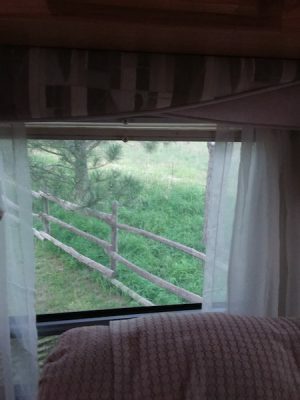 While we have just installed our skirting and will not use it until October, we are convinced we will have the coziest camp ever and are really excited to have this addition to our camping adventures - thank you EZ Snap!! EZ Snap® Team - Thanks for sending us your review and photos. Hoping you stay toasty and warm this winter! The skirting was fairly simple to install. It took my son and husband about 5 hours from snaps to skirting completion. The only issue we had was the snaps kept falling off in the heat, it was about 80 degrees, the ones in the shade stuck though. We had to buy superglue and glue one side back on. Received the EZ Snap kit and extra snaps as ordered. 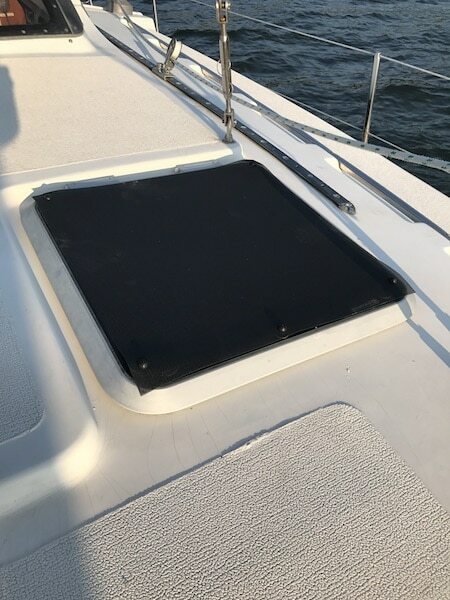 While it did come in "2" pieces (as advised it might for the length ordered), it was professionally seamed together with the velcro strips and did not hamper the installation. The drill in snaps worked perfectly and I am happy with the quality and easy of installation. EZ Snap® Team - Thanks for your positive review and photo Dennis. Nice installation! 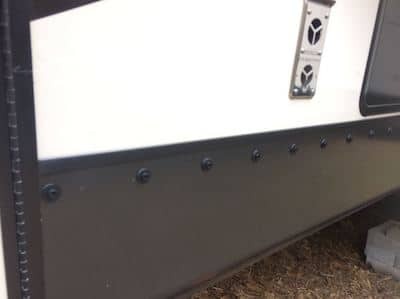 Winter had already set in by the time I could afford the skirting for my 5th wheel trailer, so I went with the screw in snaps instead of the stick on style. Then when it arrived, I got sick before I could install it so it was another couple weeks before I got started. By then it was early January. Once I got started, the installation went quite smoothly, despite the below freezing temperatures. Had it been warmer I likely would have had it done in a day, but since I had to keep stopping to warm my hands, it took me 2 days. The first day I screwed in all the snaps. Then the second day I installed the vinyl skirting. I did it all by myself. I just unrolled about 10 – 15 feet of skirting at a time and worked on small sections. I cut around obstacles (stairs, awning mounts etc.) as I got to them. I put snaps underneath each of the compartment doors that got covered, as well as along the top of the skirting, so that I could make a cut along the bottom and sides of each compartment door, creating a flap that I then held down with a couple small strips of Velcro to prevent flapping in the wind. This let me drop the flap down while my tanks were draining, which helped keep the cold out from around the valves and the tanks. 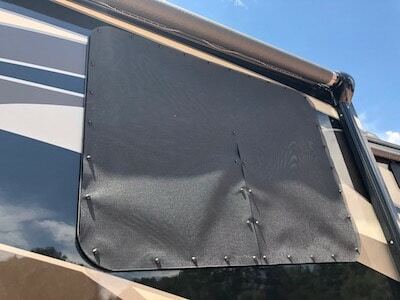 As there was already skirting around the higher fifth wheel section to create a storage area, I used the Velcro strips to attach the new vinyl to the old. To hold the bottom down, I went with pvc piping from the local hardware store, and the clips from EZ Snap to attach the vinyl to the pipe. As my trailer is 30 ft. long, I included 2 cross pieces for added stability, as well as the cross piece at the front and back. Where the sewer line connects, I stretched the skirting out over the sewer line to protect it, rather than tucking it under the RV. Then I just used a few cement blocks to hold it from blowing in the wind. I noticed a big difference, as soon as I was done. It was warmer inside, there was no more cold draft, and the furnace didn’t have to run nearly as often. 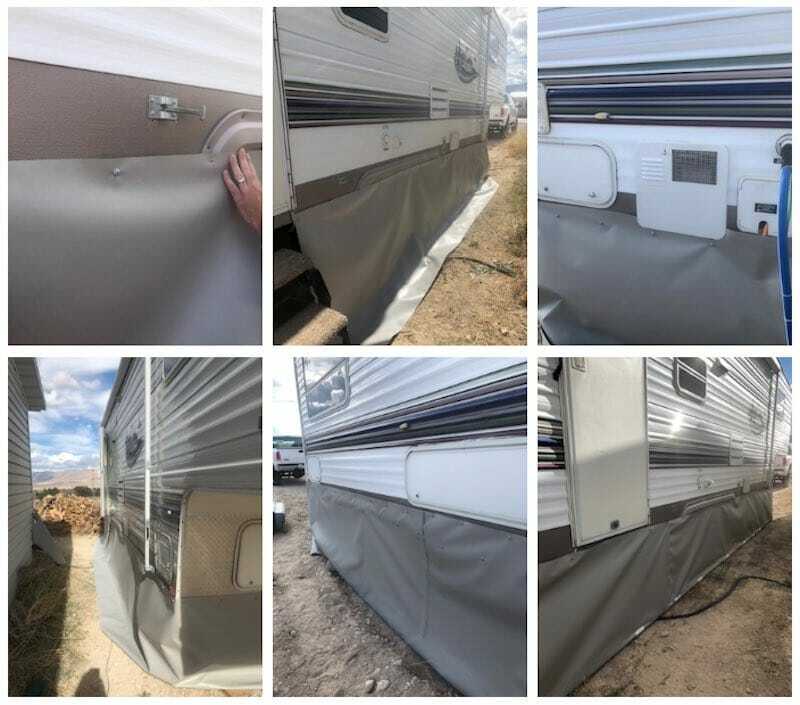 All-in-all, I am very happy with my purchase and would gladly recommend EZ Snap to anyone looking for easy to install, affordable RV skirting. 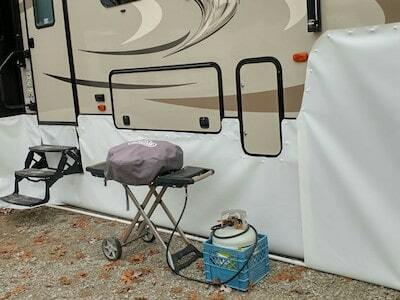 EZ Snap® Team - Nice to know the RV Skirting kept you warmer Bill! Very simple and easy to install... just needed a cordless driver, pencil, tape measure and a pair of scissors. 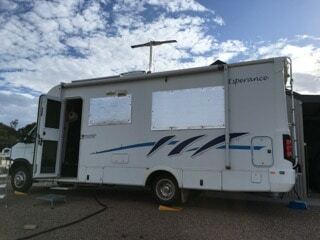 I was able to install skirting around my 33 foot RV with 3 slides in under 2 hrs. EZ Snap® Team - Thanks for your positive review Harvey. I have been delighted with my propane bill. I am very warm. The cat likes the skirt too. She guards the underside of my trailer from pests in warmth too. We completed the job just as a major snowstorm blew in. EZ Snap® Team - Happy to hear that you are saving on propane, warm, and comfortable. 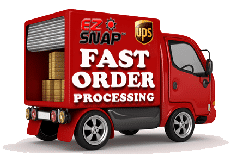 We received our EZ Snap order without a hitch. Very impressed with the service and quick delivery on our product. 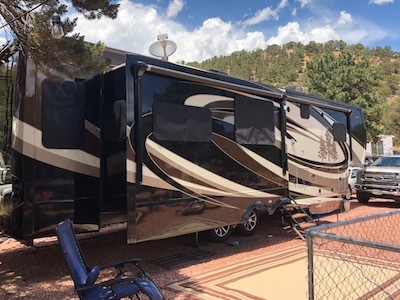 We will definitely be using you again and will recommend you to our RV community. Thanks again for your fabulous service. EZ Snap® Team - Thanks Debbie... we appreciate the compliments. 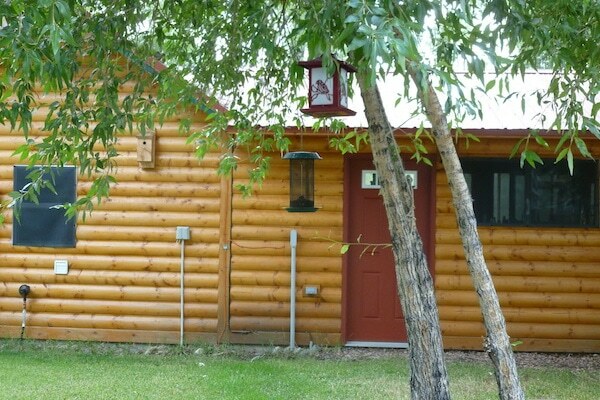 My newly-wed daughter and my new son in law live in a 5th wheel on our property to save money to buy a house. 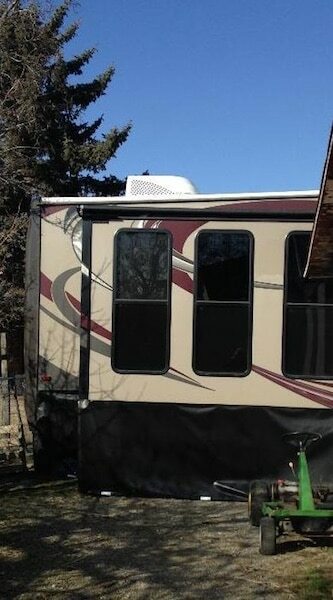 This is their second NW Montana winter in their 5th wheel and they decided to put up ez-snap vinyl siding. It was easy to install and looks wonderful. 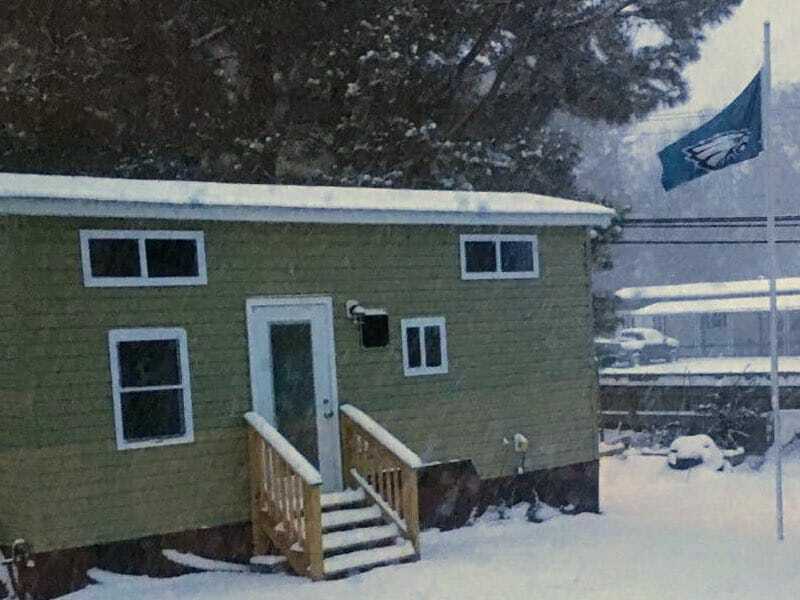 Immediately they noticed they were using less propane and their house is staying warmer. The truly amazing part though is that 2 days ago we got hit with a tremendous wind storm boasting up to 90mph winds. 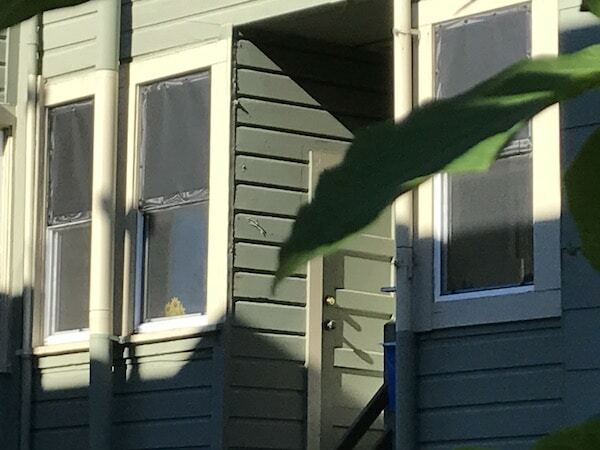 Tin ripped off the roof of the house next door, 3 trees fell on the other neighbor's roof, but the vinyl siding survived like a dream. One snap came off and was lost. That's it. We're eager to see how well it helps the rest of the winter! Thank you for your superior product! 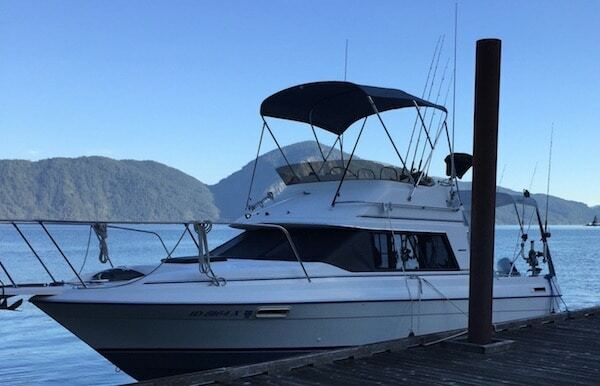 EZ Snap® Team - Thank you for Sharing your wind storm experience Kristen. When the EZ Snap pipe clamps & pipe frame are installed correctly, it makes a big difference to the wind performance. We knew we would need extra protection for the winter for our new fifth wheel that we parked in Tennessee. 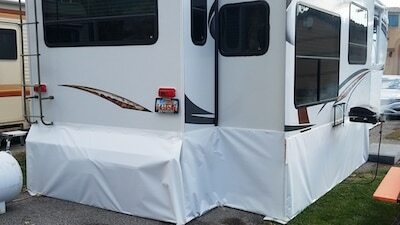 My husband did some research and found the EZ Snap camper skirting solution so we ordered it in October. It only took three days for the order to be processed and shipped out. We were installing the skirting by November 4th, 2017. We used a large woodworking square to help us measure evenly to place the 3M technology push pin bases. We also found that using a chalk line was helpful, especially when skirting around the front cap. Our lovely 1.5 year old assistant Evie provided plenty of support, along with surprise supervision from a toad! 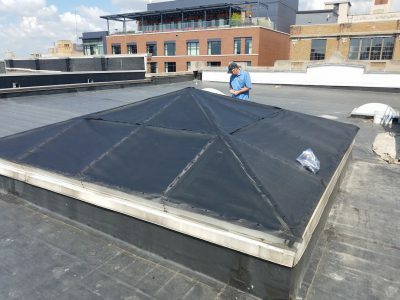 The installation was easy and went well, taking about a half day. 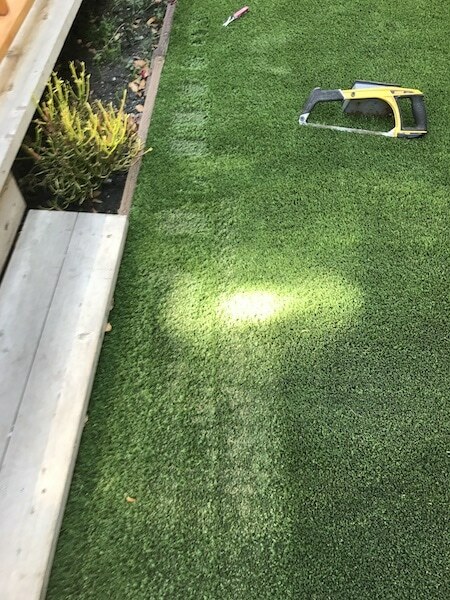 My husband used the special tool that EZ Snap sent us to slice off some excess skirting in a few places and with the exception of securing the bottom and adding some more custom Velcro and snaps around access doors, we were done! The first week of 2018 has proven that our EZ Snap skirting has played a crucial part of our survival this winter, considering that we had temperatures under freezing for over a week and did not have any trouble keeping warm nor any frozen pipes! EZ Snap™ Team - Thanks for the great review Emilee! It was very easy to install it took less than one day to have all the screw in snaps all installed and skirting hanging. 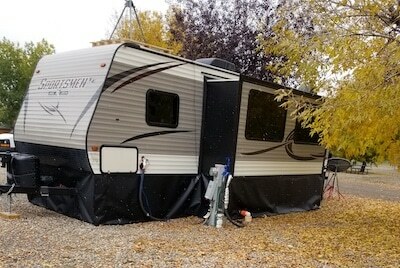 I have a 42 foot 5th wheel, within a weekend I had all of it completely installed with pipe. The price point was good and shipping was very fast. I opted in for the heavy duty sewed in zipper... Its very heavy duty. 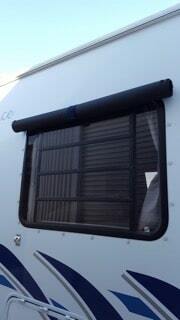 Also ordered the Velcro for the seams and it has stuck on and stayed in place through heavy wind and rain storms. 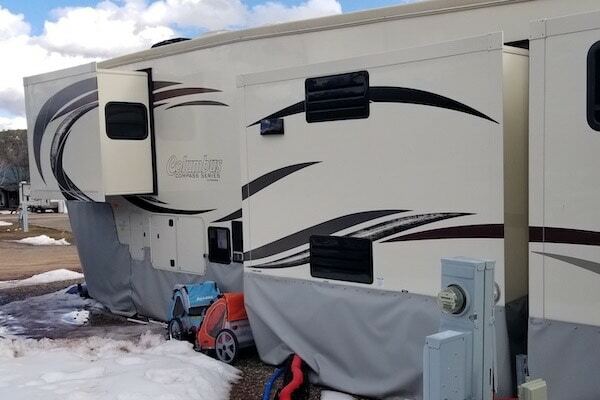 It is a very good product and I would recommend it to anyone who needs RV skirting. EZ Snap™ Team - Thanks for the great review Ian. Much appreciated. 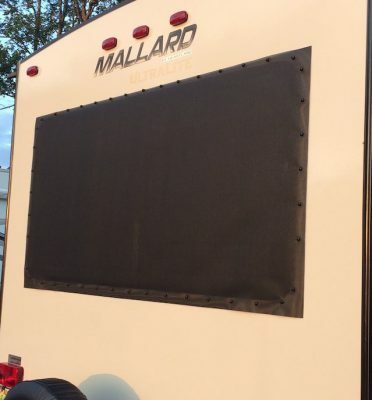 Great product only took one day to install around 42ft toy-hauler. And looks great also! EZ Snap™ Team - Thanks Steven! Very surprised at how well it keeps the cold out. Live in colorado has been hitting single digits at night 7 degrees. Have yet to freeze up. Cost was low compared to other products. Glad i found EZ Snap. Would use it again. EZ Snap® Team - Glad you are keeping warm! Thanks for the review. Installation of the skirt on our Airstream (Betty) couldn't have been easier. Cleaning the side of the trailer before attaching the adhesive fasteners took the most time and was my least favorite part of the process. After cleaning it was a straightforward and satisfying process. I purchased both grey and black fasteners. I used the black for the on the black section of the trailer and grey for silver sections, this way you don't notice the fasteners when the skirt is not attached. I was glad to have this option. Hanging the skirt for the first time required two people to ensure it is hung straight. This went much more quickly than I expected. The total time to get all tasks done was around 6 hours. We are very happy with the tidy and professional looking result. EZ Snap™ Team - Very nice installation. Well done Jeff. 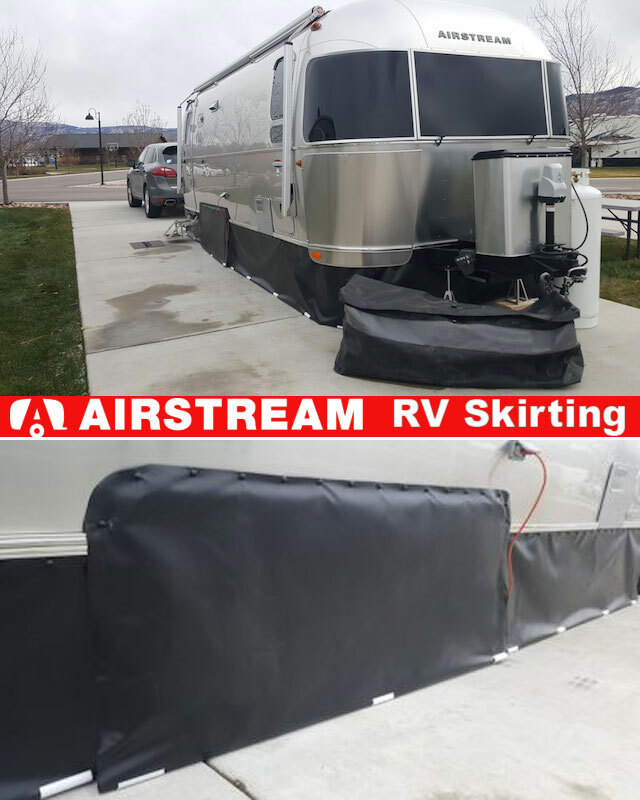 Thanks for the Airstream skirting photos. 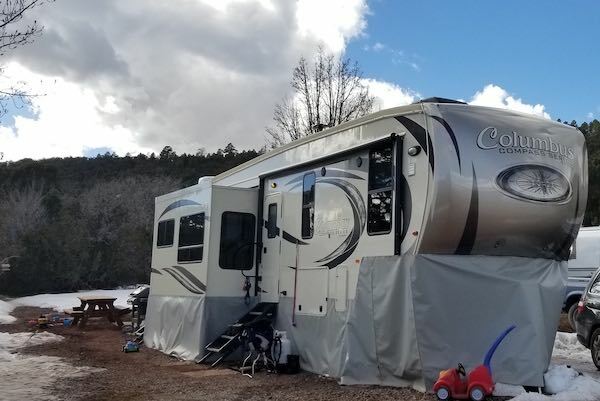 I ordered the snaps and clips to put on our travel trailer for this winter as our daughter is back home and is living in the trailer. 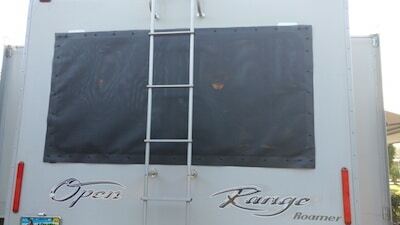 We wanted to add a tarp around the bottom to help during the winter. I did a lot of research and these were the best ones we found that we could use with our tarp. 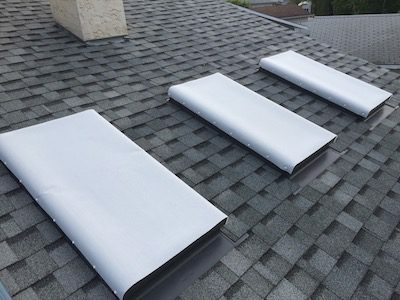 They were easy to install and have already proven their adhesion as we had a wind storm come through with 55 mile gusts and everything stayed attached. I am very pleased with the products to anyone and will definitely order more if needed. EZ Snap® Team - Thanks for your review. 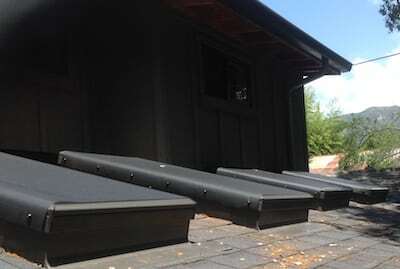 The skirting is very high quality, it is pretty easy to install in the fall and disassemble in the springtime. Also purchased the clips to hold the skirting in place and bought some PVC pipe and created a skeleton around the base of the trailer. Even with high winds it held up to the winter conditions. EZ Snap® Team - Thanks for your review Jason.